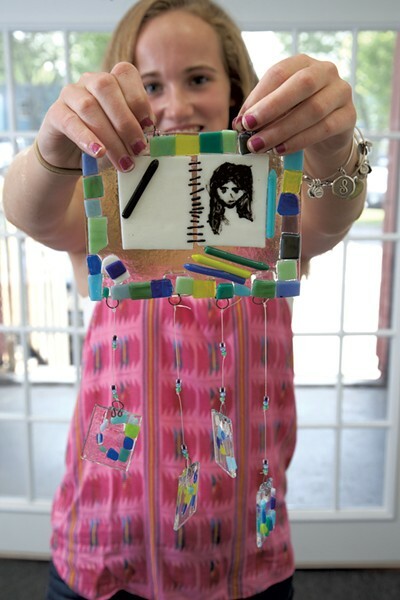 The Art of... Glass Fusing | The Art Of | Kids VT - small people, big ideas! Glass-blowing studios are a common fixture in Vermont, but there's another way artists work with the material: glass fusing. 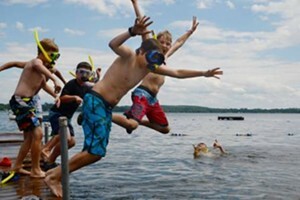 Kids can try their hands at the craft during Burlington's 22nd annual South End Art Hop this month. The Davis Studio, an Art Hop stop, offers classes in glass fusing. In August, four young artists gathered there to explain the craft, which involves cutting glass and firing it in a kiln to bond colorful pieces together. The artists, ages 11 to 15, noted that glass fusing is a more specialized, technical art than drawing or painting. They confidently threw around terms such as "making frit," "slumping" and "tack fusing." The complexity of the craft is what drew Samantha Tritt, 14, of Shelburne, to an after-school class at Davis Studio last spring. A longtime Davis student, she wanted to try something new and sophisticated. Over six weeks she created a decorative bowl, a wind chime and — her favorite — a sun catcher with four small rectangles hanging from beaded strings, spelling out the word "draw" (see photo). The creation is so special to her, she said, that she doesn't want to hang it in her room for fear that it will fall and break. Ali Barritt, 15, of South Burlington, created an array of earrings and pendants during a three-day jewelry workshop for teens and adults in July. Glass fusing can be "unpredictable," she said, because the glass sometimes changes color when you fire it, and it can be tricky to cut it into exactly the shape you want. But it's exciting, she added, to be able to make the type of jewelry she's admired and bought at craft shows for years. Davis Studio teacher Micaela Wallace acknowledges that glass may seem like "a scary, sharp medium" for kids. But she says they quickly build confidence. "I just love watching the kids really own their work by the end of class." 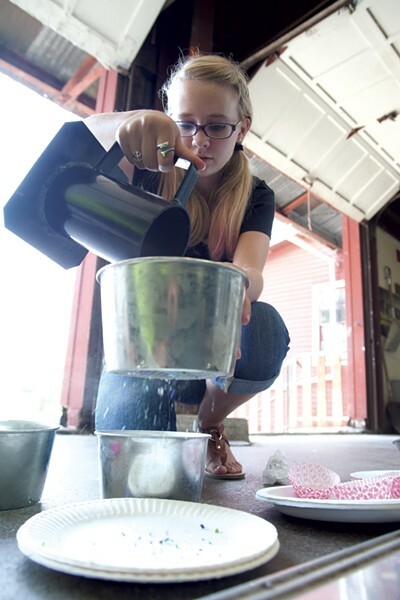 Using a tool called a frit maker, Alana Bigos, 13, crushed colored glass into small pieces, then sifted it through different strainers to create glass grains called frit, which can be affixed to flat pieces of glass as an embellishment. Ali Barritt pushed the glasscutter away from her in a straight line while applying pressure to score the glass. She then took a set of running pliers and clamped down on the glass, squeezing until it broke cleanly along the scored line. 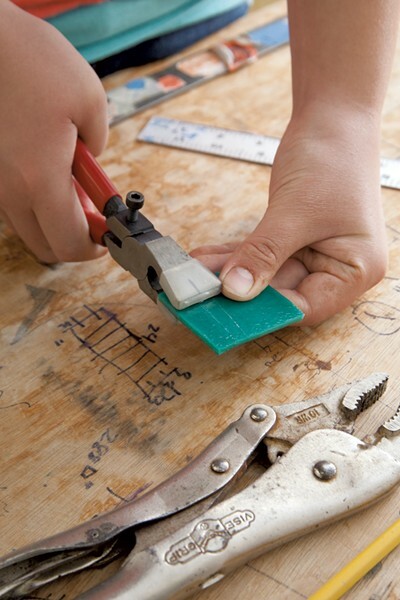 A variety of water-fed power tools help to shape glass more precisely than a hand-held cutter can. 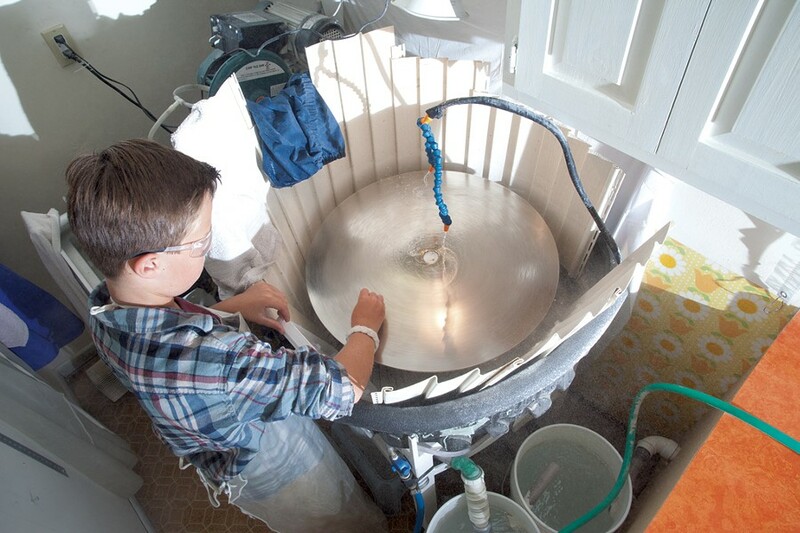 Eleven-year-old William Tritt manned a flat lapidary grinder, used for polishing glass — and stone, too. During the South End Art Hop, the Davis Studio will be open to the public for glass-fusing workshops on Friday, September 5, from 5-9 p.m. and Saturday, September 6, from 10 a.m. to 5 p.m. Using pre-cut glass, kids ages 5 and up can assemble their own sun catchers and leave them at the studio to be fired and picked up later; $5 per child. For more information about Art Hop activities, as well as fall glass-fusing classes, contact the Davis Studio at info@davisstudiovt.com.